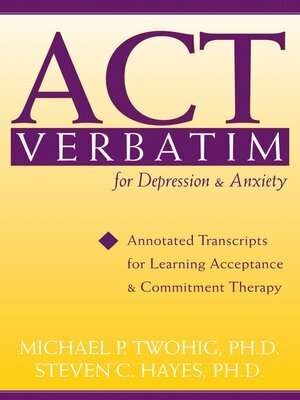 This collection of transcripts, organized and annotated by Michael P. Twohig and acceptance and commitment therapy (ACT) founder Steven C. Hayes, guides you through ACT-based therapy processes session-by-session. The transcripts featured in ACT Verbatim present common situations that arise in clinical practice, while the commentary explains how to identify the six target ACT processes and help clients work through them to achieve psychological flexibility. For the most detailed view of ACT therapy, the clinical transcripts included here follow the development of one client struggling with anger, anxiety, and depression. Since ACT is process- rather than technique-oriented, this kind of in the moment analysis is a singularly effective way to learn to apply this therapeutic model. Michael P. Twohig, PhD, is assistant professor of psychology at Utah State University in Logan, UT. He is the author of more than forty scientific articles and book chapters, most of which focus on the treatment of anxiety disorders.